Bar K is a unique and joyful destination featuring a modern bar, restaurant and coffeehouse, constructed out of repurposed shipping containers. We are located on the shore of the Missouri River in beautiful Berkley Riverfront Park, under the Heart of America bridge. We offer a “healthy casual” menu of tasty, affordable food, gourmet coffee, juices and smoothies, and a wide variety of locally brewed beers and craft cocktails in a relaxed, creative and inviting space. Surrounding the bar & restaurant is a thoughtfully designed, fully-staffed, two-acre off-leash dog park, with one-of-a-kind play structures and comfortable seating areas. “Fully staffed” means your dog will be watched over by trained dog-care professionals, so you can grab a drink or bite to eat with friends, work on your laptop, or watch the game knowing your pup is safe and having a ball. We also have a large patio and roof deck where you can enjoy a meal with your leashed dog, as well as an outdoor bar, beer garden and stage for regular concerts and speakers. Bar K brings engaged, community-minded people and their dogs together to share connections with their pups and each other in a joyful and creative space. Bar K is open 9 a.m. to 10 p.m. 7 days a week, serving breakfast, lunch and dinner. Check our calendar for special events and other programming. Anyone without a dog is welcome to visit Bar K for free. To bring your dog you must either be a Bar K Member, or purchase a Guest Pass. Check here for more info on Memberships and Guest Passes. 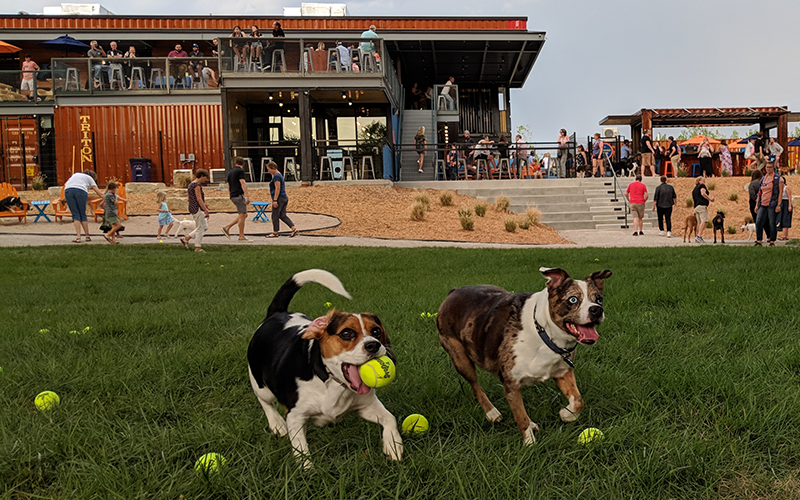 Bar K features a two-acre off-leash dog park with separate large and small dog play areas, supervision by trained Bar K staff, fun & interactive dog recreational equipment, a stage, outdoor bar, and all-weather seating areas with water, heaters, fans, shade, and shelter. We also have Puppies' Pub -- a dedicated play area just for 3 to 9 month old puppies -- as well as Petfinder Park, a dedicated space for adoption events and other programming. Built out of repurposed shipping containers, the bar & restaurant features a "healthy casual" menu of fresh, locally sourced, affordable food -- including house-made"healthy casual" fare for your pup! We also serve fresh juice and coffee, as well as craft beer, wine and specialty cocktails. You can enjoy your food and drink indoors (humans only) or on the large outdoor patio and upstairs deck overlooking the park. We have a regular slate of social, educational and recreational activities at Bar K to keep you and your pup entertained and engaged. 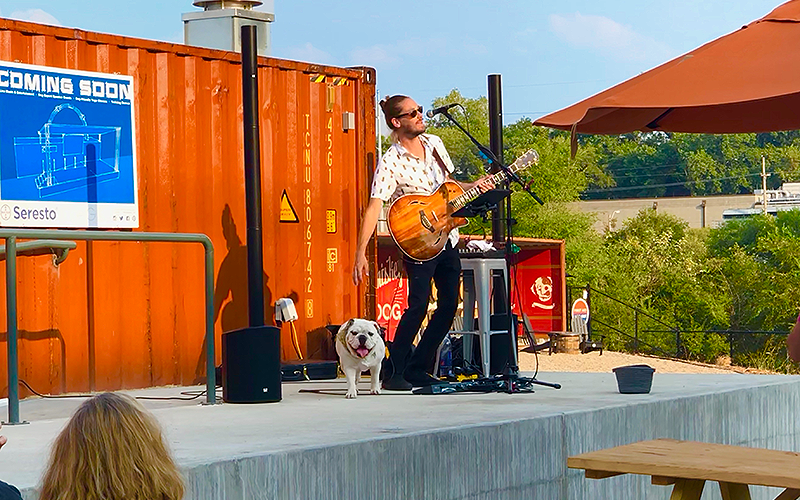 You can enjoy talented musicians performing on the Seresto Stage in our beer garden -- often accompanied by a curious pup or two! We have the Bar K Running Club, a dog experts speaker series, regular training demos, “Breed Nights,” and more. Check out our calendar for details. Bar K has multiple private event spaces that you can reserve for dog-friendly meetings, parties and other private functions. Dog or human birthday parties, non-profit fundraisers, company off-sites, client appreciation events – now you can reserve one of our spaces and everyone can bring their dogs along too! We can cater these events from our bar and kitchen. Sign up to keep up with us!